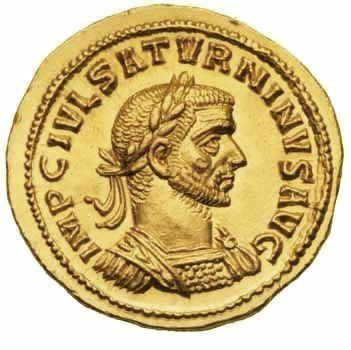 C Julius Saturninus was a Roman usurper against Emperor Probus. He was appointed governor of Syria by Probus in 279 AD, and the two were friends and allies. However, after Probus had left Syria for the Rhine in 280, unruly soldiers and the people of Alexandria forced a reluctant Saturninus to accept imperial office. He fled from Alexandria to escape the pressure but changed his mind in Palestine. He proclaimed himself emperor in 280, but before Probus could respond to the threat, Saturninus was dead, killed by his own troops. Only one coin of Saturninus is known - the Aureus shown here. Obviously it is priceless (but sold for 180.000 USD in 1991).